After this recent rally, the stock market is getting frothy again. It's not just what you buy, it's the price you pay that matters as well. An overview of 3 great companies that I unfortunately think are overvalued, and 2 that are more fairly valued. A great company doesn’t necessarily make a great stock pick, and a troubled company doesn’t necessarily make a bad stock pick. That’s because in addition to analyzing the quality of the business and the expected earnings and cash flows it may produce, investors need to consider the price they’ll pay for it. Regardless of how popular a growth stock is, it doesn’t make sense as a long-term investment if its price gets too high relative to its fundamentals. One of my favorite investors of all time is Howard Marks, the billionaire co-founder of Oaktree Capital and world-renowned distressed bond investor. His performance is one of the best in the business and he is famous for his wise chairman essays. I find that his investment advice applies well to all asset classes, including equities, and is worth listening to. When he was first starting out in the investing world as a young man, Marks initially started in equities. Bonds were out of favor at the time. Marks often points out in his interviews and speeches that there was a set of stocks in the 1960s known as the “Nifty Fifty”, which referred to the highest quality stocks in the market. These stocks, it was thought, were worth buying at any price. Coca Cola and other well-known stocks were among them. Many stocks in this group traded for well over 50x earnings. As you may guess, most of these stocks went on to perform terribly over the next couple decades. They were significantly overvalued despite the fact that most of them were great companies and popular growth stocks. In the end, it’s earnings and cash flows that determine long-term business value, and they exist in the real world rather than the dream world of high expectations. Marks, fortunately, mostly skipped that area and ended up in the dark world of junk bonds. Junk bonds back then were unseemly, considered unsuitable for respectable portfolios, and so nobody wanted them. That kept demand low and thus made them incredibly profitable for prudent investors who bought at a discount. Marks often tells the story of the 1978 edition of the Moody’s manual. The definition of a B-rated (junk) bond in that manual according to Marks was, “fails to possess the characteristics of a desirable investment”. In other words, junk bonds were by definition bad investments. Marks ironically went on to flourish and make great returns by investing in the debt of lower-quality businesses thanks to undervaluation, while the equity returns from high-quality businesses in that era suffered thanks to overvaluation. He managed his risk with a conservative and diversified approach while investing in an asset class that has a lot of inefficiencies. Nothing is really good or bad by itself. It’s all relative to price. Low valuations can make the stock of a mediocre business safer than it should be. High valuations can make the stock of a great business far riskier than buyers realize. I prefer to err on the side of a high quality businesses, but only if the price is reasonable. If I must be incredibly optimistic in my discounted cash flow analysis or projections to justify the current stock price, I pass. Currently I’m finding more bargains in value stocks than growth stocks, although there are some exceptions. Right now, emerging markets are at one of the biggest valuation discounts to U.S. stocks in history, but investors aren’t too interested in them. Global growth rates are slowing, the dollar is strong, and U.S. markets have outperformed everything else, so that’s where money wants to be going forward as well. Sometimes when I mention how cheap emerging markets are on an absolute and historical relative basis, people say, “yes but I avoid them because there is high corruption” or “they have a lot of export sensitivity to the U.S” or “but when U.S. stock fall EM stocks fall even harder”. It reminds me of Marks and junk bonds. Yes, emerging markets deserve a valuation discount. They should give higher returns in exchange for higher volatility. So, the question should be, “yes, but at what price?” Emerging markets were never this cheap relative to U.S. stocks when they had their biggest historical sell-offs. In contrast, there are many stocks in the United States that investors want to buy almost regardless of price. They’re on a great trend, they’re of great quality, so we want to own them. But there’s the pesky problem of price. In theory, any stock can surprise to the upside if its fundamentals dramatically outperform the consensus. 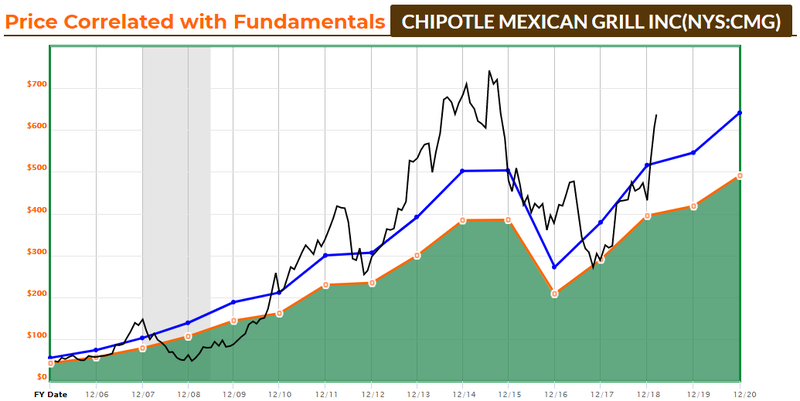 Usually, however, stocks that get into a situation where their prices far surpass their fundamentals tend to either fall back to their fundamentals, or trade sideways with lackluster returns until their fundamentals catch up. Investing is often about managing probability distributions. It’s not just about what one stock might do; it’s about what a basket of stocks with certain characteristics is most likely to do. 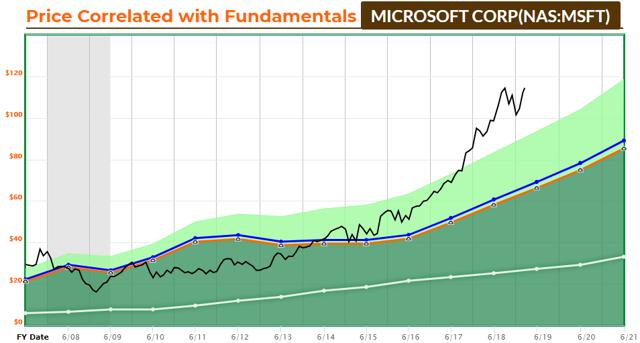 I’ve been investing in Microsoft off and on for years, and they are doing very well lately. Ever since Nadella replaced Balmer as CEO, the company has performed excellently in the growing cloud market. The problem is that everyone knows they’re doing great and capital is cheap and needs places to go, so the stock price has outpaced its fundamentals. In these graphs, the blue line represents the specific stock's normal operating earnings multiple, while the orange line represents a broadly desirable multiple for a stock in general with that level of growth (specifically, a PEG ratio of 1 for growth stocks, where the multiple equals the growth rate above 15, or a 8-15x multiple for stocks with less growth). Due to interest rates being so low, I'm willing to accept higher PEG ratios for great companies, but not above 2x. I still own Microsoft, and expect good sales and earnings growth going forward, but am not excited to buy more at this price point. I’d need to see the stock fall about 20% before it excites me again, or stay flat for a couple years as fundamentals catch up with price. That’s not so far-fetched of a scenario, considering that the stock’s 52-week low is $87. Adobe has benefited tremendously from its shift towards a cloud-based recurring revenue model, and it has plenty of room to expand and grow. Its products are so dominant in some of its key markets that their brand names are synonymous with the task itself. Unfortunately, we can’t photoshop a lower stock price. The forward PEG ratio is over 2. 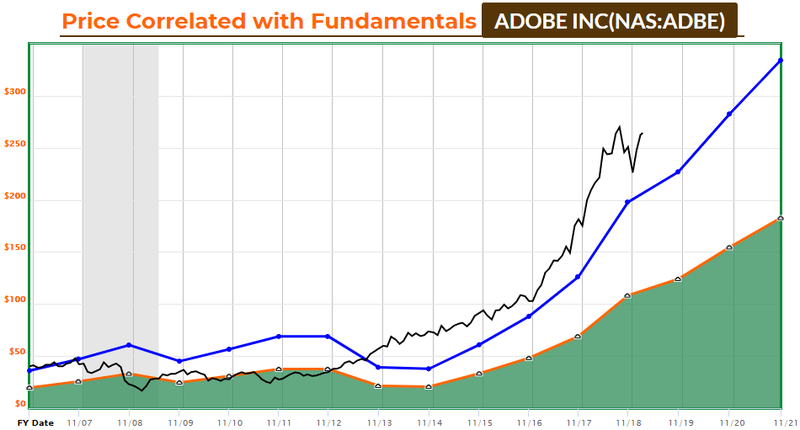 I’d need to see Adobe stock at least 20% cheaper before initiating a significant position, or for the stock to go sideways for a couple years as fundamentals catch up with the stock. I bought a tiny position in early January to take advantage of the temporary discount, because the company is just so darn strong, but even then it was still on the pricey side. I’d like to have a bigger position, but only at a more reasonable price point. I eat at Chipotle a couple times a week for my work lunch. It’s a flexible meal and can be tailored to all sorts of nutrition plans, including low-carb. Chipotle’s returns on invested capital were incredible prior to their food scare a few years ago, and the company still has tremendous operating leverage to continue restoring those levels of profitability. However, alongside the company’s strong fundamental performance leading up to 2014, the stock got ahead of itself and became overvalued. Then from 2014 to 2016, the stock had a big price cut due to a streak of illnesses associated with the company, but remained relatively pricey as bullish investors expected the company to rebound. I, for one, kept eating at my local Chipotle shop all throughout their crisis because they never had any food health issues at that location or region. These days, the company is under new management and beginning to prosper again. The balance sheet is fantastic; they have zero debt. This is certainly a company that deserves a high valuation. In contrast to the other charts in this article that I based on operating earnings, this one is based on operating cash flows which are less volatile for this time period for this company. This stock still might give good returns going forward if the best case scenario ends up happening, with the company restoring 20%+ ROIC and opening a huge number of new restaurants. But the risk/reward isn’t great at this price. The forward PEG ratio is above 2; the stock has gone straight up above fundamentals, and the P/E ratio is through the roof. It pays to be picky ten years into a bull market with above-average equity valuations. Growth stocks have outpaced value stocks for 12 years now. This has been a market where throwing money at the fastest-growing names has easily paid off, much like the 1990’s. Going forward over the next several years, however, this trend might not continue so smoothly. I’m investing with a bit of a value tilt now, where there are many companies trading at or below my estimated fair value. Additionally, ex-USA equities appear reasonably-priced, especially in the emerging markets. For this article, however, I’m focusing on reasonably-priced growth stocks. Alibaba is one of China’s premier cloud/online growth stocks, and China’s biggest growth stocks tend to trade at lower valuations than their U.S. valuations at the current time. There’s a lot of political drama and economic uncertainty around China right now, which takes some of the cheer out of the valuations and gives investors more of a chance to spot bargains. Still, China’s GDP is growing faster than the GDP of the United States, and most of the big Chinese growth stocks (KWEB) don’t have direct exposure to the corporate debt problem plaguing China these days. 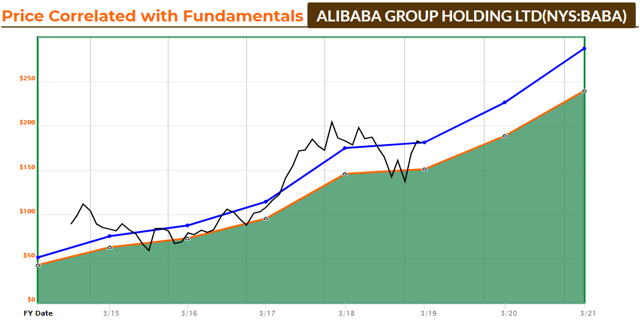 With a PEG ratio not far above 1, Alibaba is a classic Peter Lynch style growth-at-a-reasonable price stock pick at these levels. 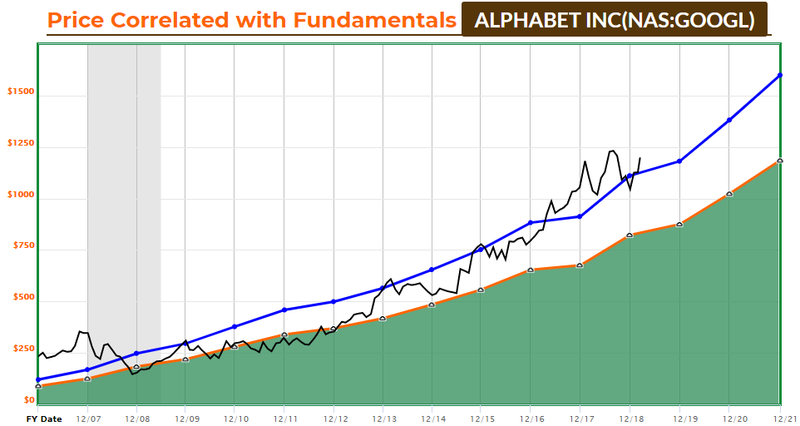 Additionally, I am fairly bullish on Alphabet (GOOGL) at current prices and am long the stock. I’d like to see a 20% sell-off to load up, but am willing to buy some more at the current price when I take into account how strong the balance sheet is. I bought my current small stake in early January when we had a nice dip. All of this is not to say that one specific stock will for sure outperform another specific stock. I can’t tell you for sure that Alibaba will outperform Adobe over the next five years, for example. I suspect it will, but I don’t know. But on a larger scale, when building a portfolio out of multiple stocks, history tells us that investors tend to do better when they pick a collection of names that aren't priced beyond perfection. Disclosure: I am/we are long GOOGL, KWEB, MSFT, ADBE. I wrote this article myself, and it expresses my own opinions. I am not receiving compensation for it. I have no business relationship with any company whose stock is mentioned in this article.